On May 4, 2018, the largest earthquake in 43 years struck Hawaii 'I with a magnitude of 6,9 in the region on the island of Hawai' I (the "Great Island"). 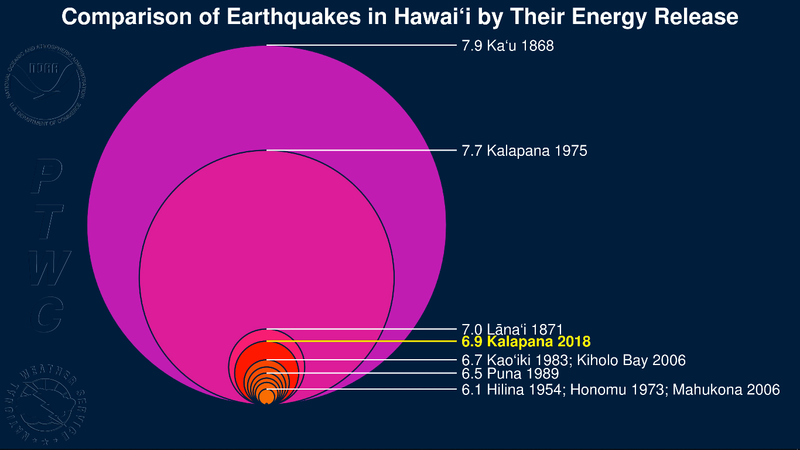 This animation places this earthquake in a historical context by comparing its magnitude to that of other earthquakes that have hit these islands over the last 150 years. The timing of the moment is proportional to the total energy release of an earthquake so that every increase in the whole number represents an increase of about 32 times the energy release. For example, an earthquake m7 releases about 32 times more energy than an earthquake m6. in this animation, the circle of an earthquake m7 about 32 times the surface of an earthquake M6. Each circle is also labeled for Show its magnitude, location and year when it happened. The animation reveals that three earthquakes are known for having been more important - that is, released even more energy - than the earthquake in 2018. 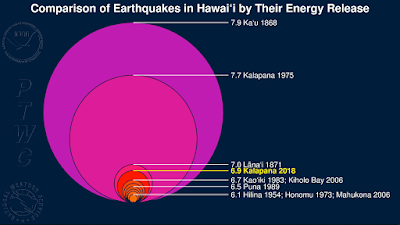 The animation ends with a map showing where Each of these earthquakes occurred in Hawaii.